[Updated at 1:11 p.m. ET] Rescuers tunneling Friday into the rubble of the eight-story building that collapsed Wednesday discovered another 50 people trapped on what remained of its third floor, an official said. Bangladesh Fire Service Deputy Director Maj. Mizamur Rahman said rescuers were hoping to free them within a few hours. Also Friday, two women who gave birth under the debris were rescued - along with their infants - a fire service official said, according to BSS. Miracles never seem to stop for these people in Bangladesh thank God..Building with subpar building codes and shoddy workmanship make for a building just waiting just like this one to collapse..My prayers go out to everyone including the real heroes those of the fire rescue and special squads sent in to harms way to rescue them.Good luck to all!!! Not only buildings collapse: so do empires and languages. CNN puts into writing that 1 World Trade Center "will be comprised of" (many things). The proper use of "to comprise" is a common requirement to get jobs, jobs, and more jobs as a line editor. Once upon a time, one had to use "comprise" correctly to earn a now meaningless high school diploma. God save the English language. @Joey,how right you are with some of these posts from supposid intelligent people..It's as bad as UN running N Korea and you know how bad that is,have a good one Joey!! Today One World Trade Center becomes the tallest building in the hemisphere. During the Twentieth Century, the USA produced the tallest skyscrapers in the world, for a while. It's not–not really–that we have more important things on which to spend our money, such as food stamps. Something terrible happened to our country. What was it? We all need to think about it, because it's getting worse. I see that my post was rejected. Don't criticise: that upsets folks. Millions of poor women work for western countries in garment factories in Bangladesh. This job opportunities gave them freedom, security & dignity. 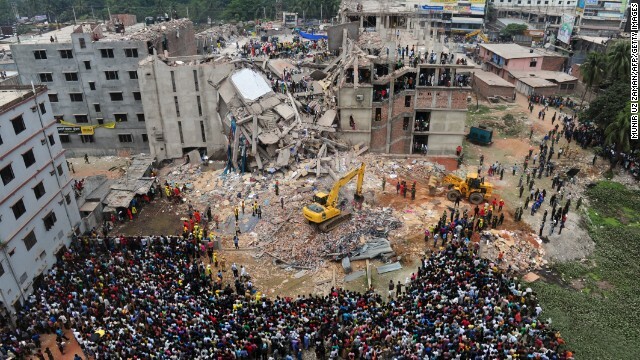 After building collapse at Savar, Dhaka many branded western companies are pulling out their business from Bangladesh. This is not a punishment to the garment owners or any corrupt politician, rather it will cause suffering to those poor women who had some dignity, freedom & hope of better life. Without garment sector there will be no jobs for these illiterate poor women, they will be exploited by our corrupt society. It will bring misery, malnutrition & suffering to poor women only. Instead of helping & restructuring our garment sector, I feel it is a wrong step by the western companies to pull out their business from Bangladesh.